Headphones offered me my first chance to experience musical details that never came through my primitive, early stereo systems. They allowed me to listen to whatever I wanted to at any loudness I chose, no matter what parents, cretinous roommates, or my beloved spouse thought of it. And unlike other harmless adolescent enthusiasms, I've found that passing years haven't dimmed my enjoyment one jot—especially not where the Sennheiser HD-580s are involved. 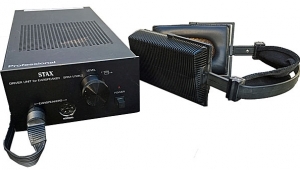 Let me proclaim, right up front, that I can name no other under–$3000 transducer that can match their strengths: near-linear response from 16Hz to 30kHz; (almost) total lack of coloration, especially in the high frequencies; uncompromised dynamic resolution; and unsurpassed comfort. All this for $349, and you can play Pork Soda at 3am on a school night. 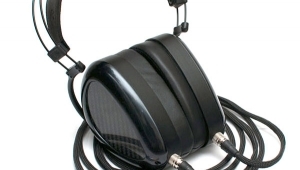 As Tom Norton pointed out in his February '94 review of the flagship gigabuck Sennheiser Orpheus HE 90 (Vol.17 No.2, p.111), headphones are probably the most commonly used music sources around. Many of them—perhaps all of the ones attached to Walkpersons—are horrendous: tinny, bass-shy, compressed, musically anemic. But this doesn't mean that all must be tarred with the same brush, any more than all stereos should be excoriated just because the majority (ahem) spew chunks. That's what magazines like Stereophile are for—to uplift the race. Despite the ubiquity of the headphone, there are some generic problems with them that must be acknowledged. First is the question of spatial perspective. If you use headphones through a standard 'phone jack, there's no way you're going to get any soundstaging. And you can just forget about outside-the-head localization (footnote 1). With everything from Wagnerian orchestras to Brazilian tree toads, even the finest "cans" give you that center-of-your-head location. This can be disorienting; it's the rare audiophile indeed who really wants a Brazilian tree toad in the center of his or her head. 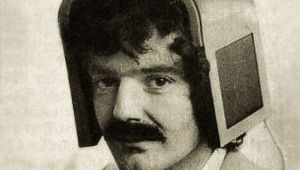 Attempts have been made to compensate for this, ranging from processors—such as those made by Stax and HeadRoom, which combine information from both channels to simulate a listening space—to bulky helmet-like apparatuses, which place the drivers to the front of the ear. But even the best-sounding headphones are of no use to you if you don't like to wear them. Comfort is the second most frequently cited objection to headphones. 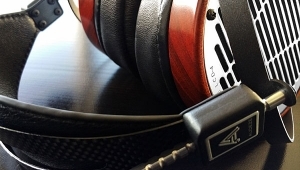 The discomfort experienced by high-end headphone wearers can be attributed primarily to three causes: weight, sweat-producing earpieces, and caliper pressure, aka "that vise-like feeling"—all of which are remediable through intelligent design. 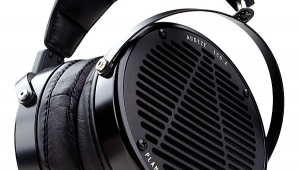 "Intelligent design": now there's a description of the HD-580s. In terms of comfort, I've never met their match. All surfaces that contact the head or surround the ear are swathed in a velveteen material covering open-cell foam. The earpads and headband sit lightly and, since they "breathe," are extremely comfortable—even during New York's humid summers. 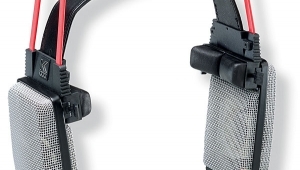 The Sennheisers weigh a total of 260gm (for you metricphobes, that's about 9oz), which is supported over the entire headband and feels light on the head, no matter how extended the listening session. Sennheiser, being German, has come up with a measurement for caliper pressure: approximately 2.5 Newtons. Sir Isaac never sat on my ear, so I'm not sure what that means exactly (footnote 2). Regardless of the measurement, the 580s remained comfortable hour after hour. 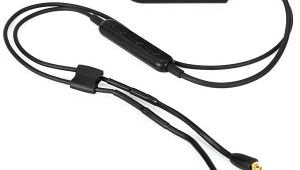 The adjustable headband stays adjusted, and the earpieces are free to move vertically in relation to the headband, adding to long-term wearability. The oval circumaural earpieces are large enough to comfortably cover even my huge ears, and their open-air design allows environmental sounds—such as ringing telephones—to be heard. 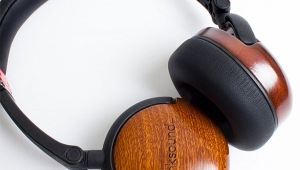 If enlightened engineering has taken care of comfort, then has it also eliminated that signature headphone sound? Sorry, no. To solve the spatial recovery problem, you still have to employ specially designed processors, which I intend to examine in future pieces; but, paraphrasing mystery writer Jonathan Valin (footnote 3), why are so many of us hung up on looking at the music? Sometimes you just need to shut your eyes and listen. To be musically valid, the experience of listening to headphones doesn't have to be identical to that of listening to your main system any more than listening to your stereo need be identical to the real event. I'm not suggesting that we jettison live music in a real space as our reference, but we must acknowledge that, as discrete experiences, each type of listening has its value and place. Yes, you do give up some seductive imaging information when listening to even the finest headsets. Ambience suffers as well. What you gain is an immediacy, a sense of proximity to the music that has its own appeal. I'm reminded of the orchestral concerts at Carnegie Hall where I've had front-row seats, from which the beautiful hall-acoustic is almost totally obscured by the incredibly powerful direct sound of the instruments. It's quite a rush, wallowing in the sheer sound. While I'm not about to forsake midhall—or even upper-balcony—seats, neither am I immune to the charm of front-row immediacy. This was brought home to me when I listened to Corigliano's Symphony 1 (Erato 2292-61132-2). The power, impact, and lack of room acoustic were similar to those experienced when, sitting in the eighth row, I heard Barenboim and the CSO perform the piece in Carnegie Hall. In this case, the headphone perspective was directly analogous to, although by no means the same as, my concert experience. I should also point out that, unlike front-row seats at Carnegie Hall, headphones do not change the ensemble balance when giving you that thrilling up-close sound. For the final concert at Carnegie before the renovations, Isaac Stern was the soloist in Beethoven's Violin Concerto. The audience was hanging off the rafters that night. We were sitting in the first row, this time on the far left. The sound was huge, direct, and exciting; but while we had no trouble hearing Stern, the first violins, or even the woodwinds, the violas and basses on the far right of the stage were way down in the mix. In this sense, the Sennheisers would have the advantage over the concert hall. A musically significant complaint lodged by many against headphones is the loss of a sense of deep bass. It's true that much of the "rump-rumble" sensation is extra-auditory; the skin itself serves as the sensor through which we receive the physical nature of bass. The HD-580s are rated to a staggering 16Hz, and I feel satisfied that they do produce that bottom octave in the proper proportion to the rest of the spectrum. Call me crazy, but while listening to deep bass at high volume through the 580s, I felt the skin on my ears tingling. In "Jungle Blues," from the Dirty Dozen Brass Band's Jelly CD (Columbia CK 53214), the group uses a huge bass drum. Not only did the 580s capture the impact of the mallet on the membrane, but they conveyed the slow decay of the tone as the drum head slows down and finally stops. Man, I just kept playing this track over and over and over, cackling maniacally as I paced back and forth in front of my windows (footnote 4). Did I mention that the music on this track is also pretty cool? In addition to all of that detail on the big drum, the band is wailing away with tuba, trombone, two trumpets, three saxes, and two hand-drummers—whew! A lot of musical information to sort out, but the Sennheisers were up to it. A by-product of their accuracy, however, was their revelation of the painfully bright nature of this recording. As an audiophile dedicated to truth, accuracy, and reality, would I be perverse for mentioning that I found myself growing irritated at the Sennheiser HD-580s for consistently revealing what was really there? Some listeners find the HD-580s somewhat soft on the top. I don't. I find them true to what's on the disc—sometimes, I admit, to my chagrin. However, I suspect that I know what has caused this assessment. The Sennheisers exhibit less grain, glare, or other hi-fi coloration than well-nigh any other transducer that I have heard. Many listeners have never heard a stereo system that doesn't contain at least a trace of these artifacts. As we have fewer and fewer opportunities to hear unamplified musical performances, these colorations are increasingly perceived as the signifiers of accuracy, since most people use hi-fi as its own reference. Here we have a true feedback loop, with major implications for the way that sound is presented. Most headphones are so colored tonally that they create a completely different sonic portrait from the one that a high-end system would present. The 580s sounded remarkably like my hi-fi. The first day I had them I adjusted the gain so that the Sennheisers and my reference system matched, and spent a happy hour pulling them away from my ears to compare them to the ProAc Response 1Ses. Virtually indistinguishable, at least until I threw on the house/ambient sampler CD from Barramundi (Antler-Subway ASW 6115). The synthesized bass came through more palpably on the '580s. Does this mean that the Sennheisers are superior to the ProAcs? No, merely that their bass extension for this music was superior to that of a $2000/pair loudspeaker. If forced to choose only one of the two, I'd have to go with the ProAcs—but I'd hate to have to make that choice. 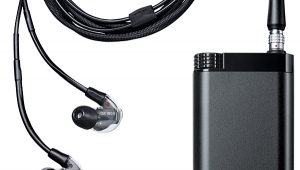 Sennheiser has achieved this level of quality with the HD-580s through a canny application of the technology developed in the manufacture of their reference-quality microphones and, of course, the Orpheus HE 90. The diaphragm is constructed of a mixture of polycarbonate and polyurethane to achieve a lightweight piston that resists pure polycarbonate's tendency to liquefy under the boundary demands of a 20kHz signal. Since headphone and microphone diaphragms don't use compliant surrounds, the edge of the transducer is subjected to a lot of stress at its anchor points—so much stress that excessively rigid materials tend to liquefy, or distort, when subjected to it. 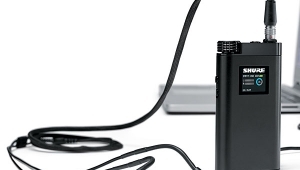 Denied one escape, the material will seek another, so Sennheiser used laser interferometry to optimize the rigidity/flexibility equation toward accuracy. They also use a triple-wound aluminum voice-coil, partly for that material's heat-dumping properties, partly for its low mass. The coil surrounds a neodymium rare-earth magnet designed to improve control of the coil. 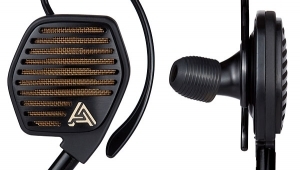 Oxygen-free–copper signal cable is wrapped in a Kevlar-reinforced jacket for durability—an important feature, since the HD-580 is terminated to a stereo miniplug to facilitate use with portable stereos. Actually, I didn't realize this at first, since the miniplug is inserted into an extremely high-quality mini-to-phono adaptor. The fit was so tight that, at first, I never suspected the presence of the real termination. Well done! That miniplug suggests strongly that the HD-580s are aimed at the millions of personal stereos out there. Indeed, it would be foolish of Sennheiser not to covet so vast a market. However, despite the efficiency of this 300 ohm design (fig.1), most portables will not drive the Sennheisers to satisfactory volume levels or adequately control the deep-bass response. Oh, they'll play coming straight out of your Walkman Pro or Optimus CD-3400—their sound just won't be as I've described. For that, you'll need something more powerful. Fig.1 Sennheiser HD-580, electrical impedance (solid) and phase (dashed) (50 ohms/vertical div.). There are quite a few headphone amps on the market. 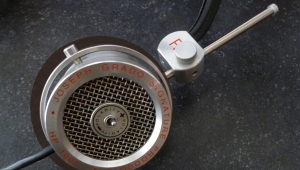 I've already mentioned the HeadRoom designs, we've extensively reviewed the Melos SHA-1, and Grado makes a good'un, too. These are definitely the way to go for optimum listening pleasure. 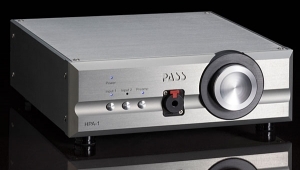 The headphone amps of many high-quality integrated amps and receivers sound good as well. For example, the Arcam Alpha series integrateds really made the 580s sing. An audiophile on a budget could do a lot worse than pairing the Sennheisers with an Arcam, Creek, or NAD integrated while saving up for some full-range speakers. Drive the 580s properly, and you'll revel in the sheer power of their sound. I played Stereophile's August '94 "Recording of the Month," Terry Evans's Blues for Thought CD (Pointblank 39064 2, footnote 5) and simply rocked out. The Sennheisers revealed the nuance and conviction of Evans's vocals, from his rough, stuttering growls on "Get Your Lies Straight" to the lyricism of his reading of "That's the Way Love Turned Out for Me." I kept turning up the volume, driving Ry Cooder's guitars louder and louder—well, actually, that's something you're going to have to be careful about. 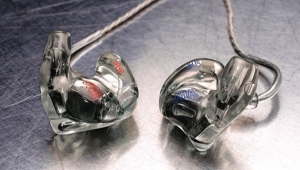 The 580s' low level of distortion and freedom from the "hotted-up" sound of most stereos can fool you. I know that I tend to listen to these headsets a lot louder than I do my speakers—hey, that's one of the blessings of headphone listening. But this is your hearing we're talking about—it's hard to appreciate those subtle differences through a case of progressive tinnitus. I really hate it when audio reviewers act as if actually buying a product they've reviewed makes it—you know—special. Big deal! Most people do buy their systems, yet the average person doesn't say, "You wanna know how good it is? I actually bought it. Pretty radical, huh?" Footnote 1: Binaurally recorded source materials (such as John Sunier's discs) are a completely different story—one that I'm not dealing with here, but will examine in the future. Footnote 2: My wife, boasting a superior grasp of physics, has pointed out that a Newton is a unit of force, obviously based on the downward force exerted by one Fig Newton. I feel so foolish. Footnote 4: This illustrates another disadvantage of headphones: the outside world has no way of knowing what you're reacting to, as I realized when I looked up to see my neighbor across the air-shaft staring at me with concern. Footnote 5: You haven't gotten this CD yet? What are you waiting for?! It's fantastic!